GRETTA Kennedy was never expected to walk or talk so writing her debut children’s book was no small feat. Ms Kennedy was born with the congenital disorder of glycosylation type 1a, or PMM2 CDG, a rare genetic metabolic condition that affects co-ordination, balance and muscular activity. Only 800 children and adults in the world have been diagnosed with the disorder, including two of Ms Kennedy’s three siblings. It’s a disorder that makes even the simplest tasks, like writing an autograph on the inside cover of her books, painstakingly difficult but not impossible. Despite being told by doctors that she would never walk, talk or even go to school, Ms Kennedy took her first step when she was three years old, though not without many falls and therapy. Her mother Rosslyn Kennedy, who worked for The Catholic Leader in 1975 when Gretta was a baby, would “walk her up and down on the beach to get the strength in”. “And she’d sing a song to me, ‘These boots are made for walking’,” Ms Kennedy told The Catholic Leader. She has defied all odds to become an accomplished, winning artist and now the proud author of her first book, Anna – Just Being Me. Anna – Just Being Me is based on Ms Kennedy’s personal experiences of bullying and acceptance during her time at Our Lady Help of Christians, Redcliffe, now part of Southern Cross Catholic College. It was a painful and frustrating time in her life. Children would make her “talk like a baby” and she was teased about the problems with her speech and balance. “One guy in particular, I remember when we were walking home from church that day, a girl was acting silly and he said ‘Don’t be a spastic like Gretta’,” Ms Kennedy said. There were also moments of great victory, like the time Ms Kennedy “practised and practised” until she could part ways with her Velcro shoes and tie her laces like the other children. 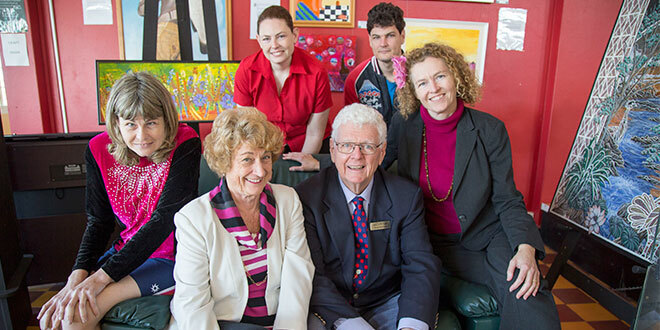 Family ties: Gretta Kennedy with her parents Rosslyn and Doug Kennedy (centre), younger siblings Phoebe and Lachlan who were also born with PMM2 CDG, and eldest sister Cristin Kearney. Photo: Emilie Ng. Launched last year by Councillor James Houghton at the Redcliffe Library, where Ms Kennedy has worked for 21 years, Anna – Just Being Me is the first instalment in a mini series originally written for her niece and nephew. “I wanted to teach my niece and nephew to understand people with a disability,” Gretta said. In the book she offers six tips on how to treat people with a disability, but her biggest message is to stop staring and be kind. While she may never know why she and her two siblings were born with the rare disorder, the prayerful Catholic believes there is a God-given reason. “Well, I guess it’s good that I’ve got the thing because if I didn’t I wouldn’t have written this book,” Ms Kennedy said. She is hoping other inspirational figures from around the world will spread her book’s message that people with a disability are no different to anyone else. “I want to be on Dr Phil and Ellen DeGeneres’ show and promote my book to the world,” Ms Kennedy said. Ms Kennedy has already sold more than 200 copies of her book and hopes Catholic schools across Brisbane will use them in the classroom. 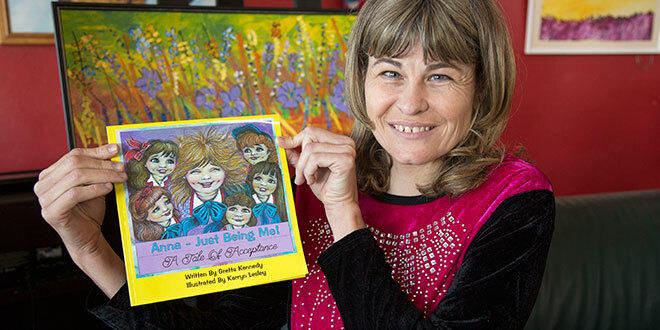 Anna – Just Being Me is on the shelf at the Brisbane City Library, and nearly all libraries in the Moreton Bay region. Copies of the book are available for purchase on Amazon, or at Seaside Artists Gallery on Redcliffe Parade, Redcliffe. WIN! The Catholic Leader is giving away two signed copies of Anna – Just Being Me! by Gretta Kennedy. For your chance to win a copy, send your name, address and a contact number to info@catholicleader.com.au or write to us at GPO Box 282 Brisbane QLD 4001.